While cleaning out a storage space, I came upon an old oak bread tray. The type that bakeries used to deliver fresh bread to the stores before the advent of the stackable plastic versions. I think we acquired it at an auction or estate sale, probably because it was old and unique. But eventually, it ended up in storage, filled with other unneeded items. With some reluctance, we determined that we no longer had a use for it and that it was headed to the yard sale pile. But a day before the yard sale, I realized it deserved one more chance before changing owners and an unknown future. My sister saw the piece and asked if I would convert it into a coffee table for her den. Somebody else wants my junk? Even better. Sure, I’ll convert it! This wasn’t a big project but required the right design and materials to make the combination of the table base and bread tray top look as if they at least came from the same era. 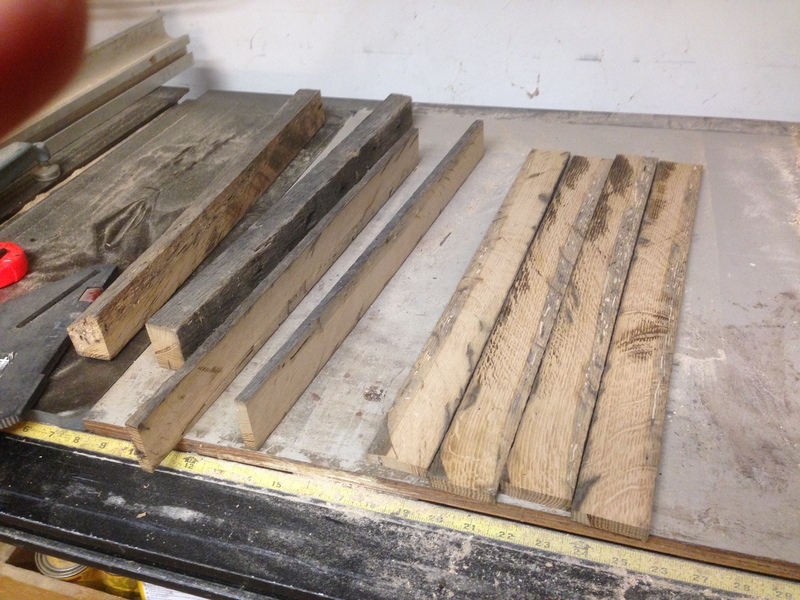 I went to my stack of ancient white oak and selected a well-worn 2×8” from which I could extract four legs, some stretchers and cross-braces. I knew that the character of the lumber and its affinity to accept stain would be unique so I really wanted to cut all of the pieces from a single board. This 2×8 piece clearly had it’s share of weather and insects and that made it all the better, even if it was twisted and so hard that I thought it was nearly petrified. 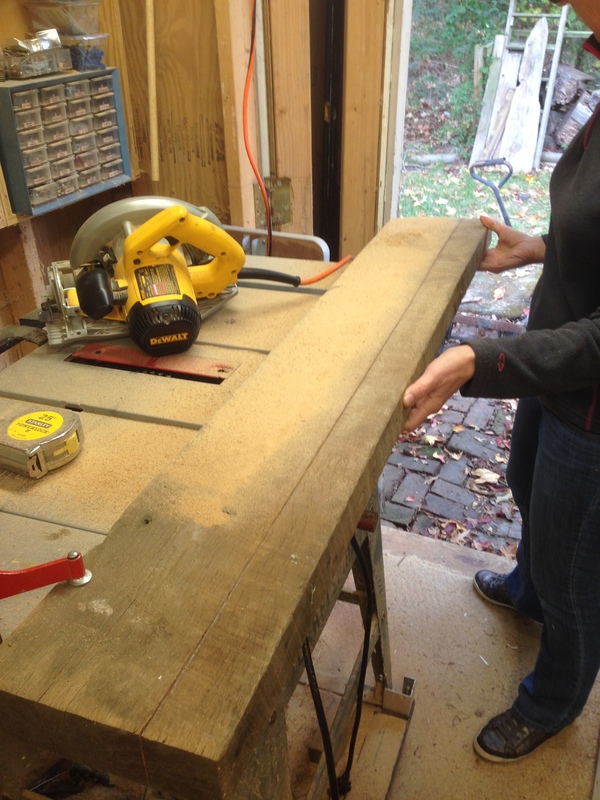 The bread tray was already 5 1/2” deep so creating a coffee table at the recommended height of 19-21” was a little trickier than working with a simple slab of material. The top of the box couldn’t be too high but the inside couldn’t be too low. We agreed that the top of the table would be 21” and the inside bottom would be 16”, thus finding a workable medium for both functionality and appearance. 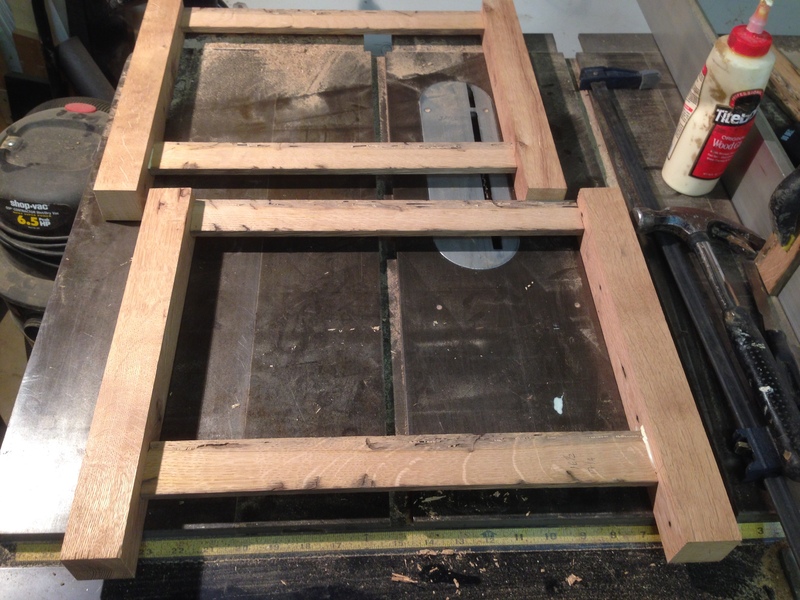 I first wanted to cut four legs from the stock with a final dimension of 2x2x16”. 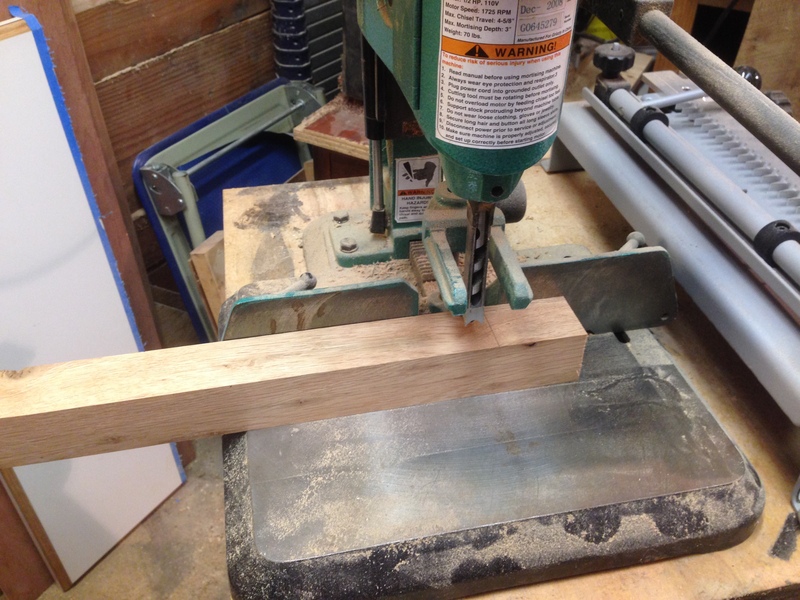 I rough cut with a hand saw a couple strips of the stock (roughly 2 ½ x 2 ½ ”), leaving enough material to allow me to straighten out the twists in the wood and still have enough material to meet my final dimensional requirements. I also rough ripped material for the stretchers and cross braces at the full board height by ¾”. This would give me the maximum material to allow planing and clean up. 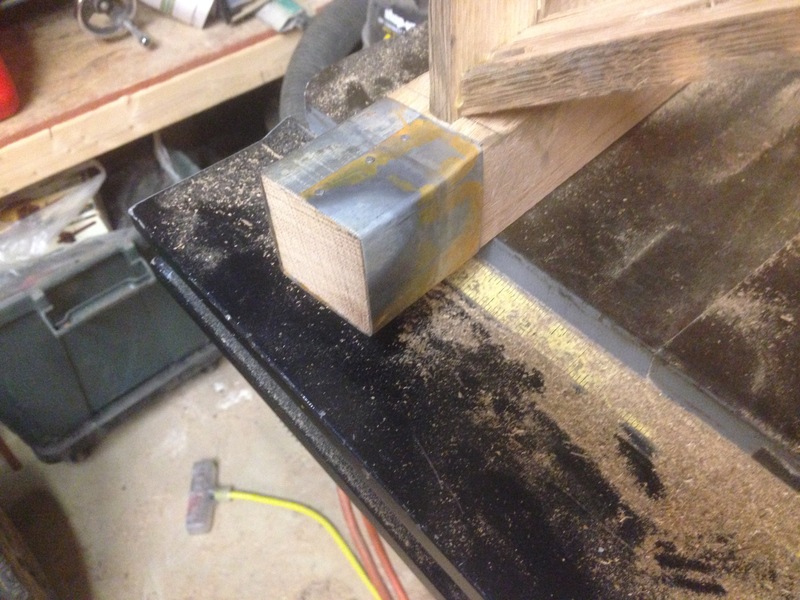 Since the stretchers and braces were going to be relatively small, I decided that mortise and tenon joinery would provide the greatest strength. 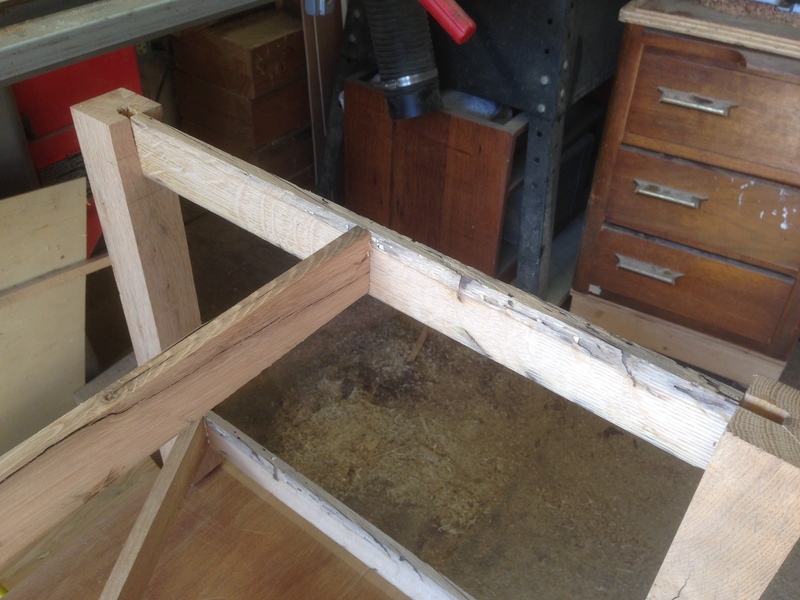 Using my ½” mortising chisel, I made mortises on each leg to accept the upper and lower stretchers. 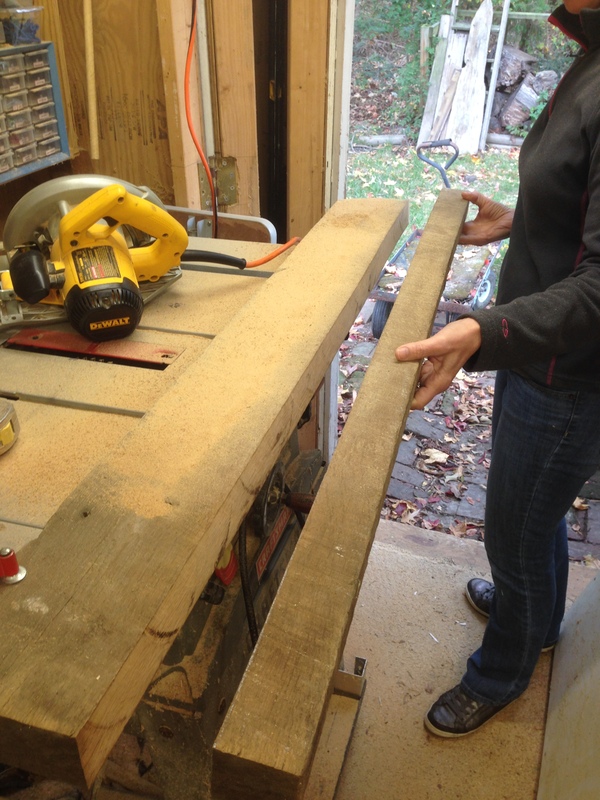 Again, my stock for the stretchers was well-worn lumber with brittle edges, so I wasn’t concerned about exact fit. It just needed to be solid and square. A little glue would help lock it all together. 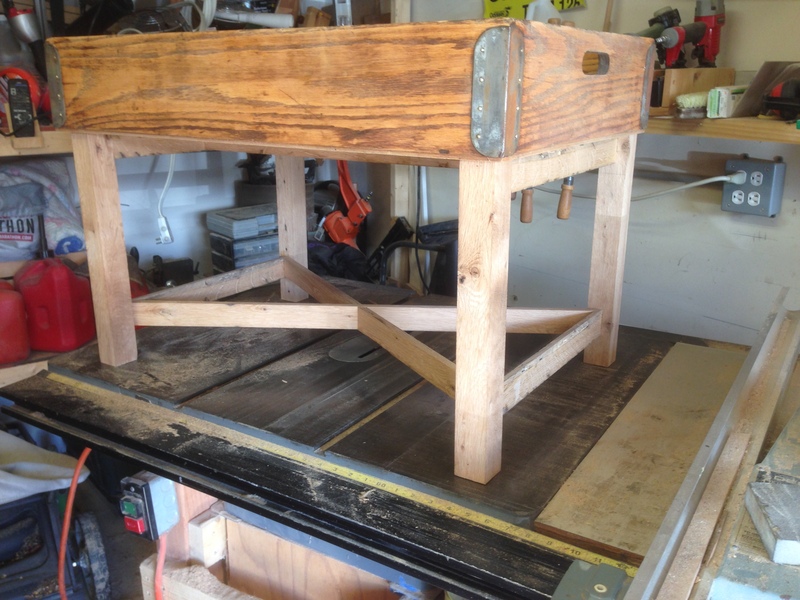 Mortising machine set up to make 1/2″ mortises in the center of each leg at the top and bottom. 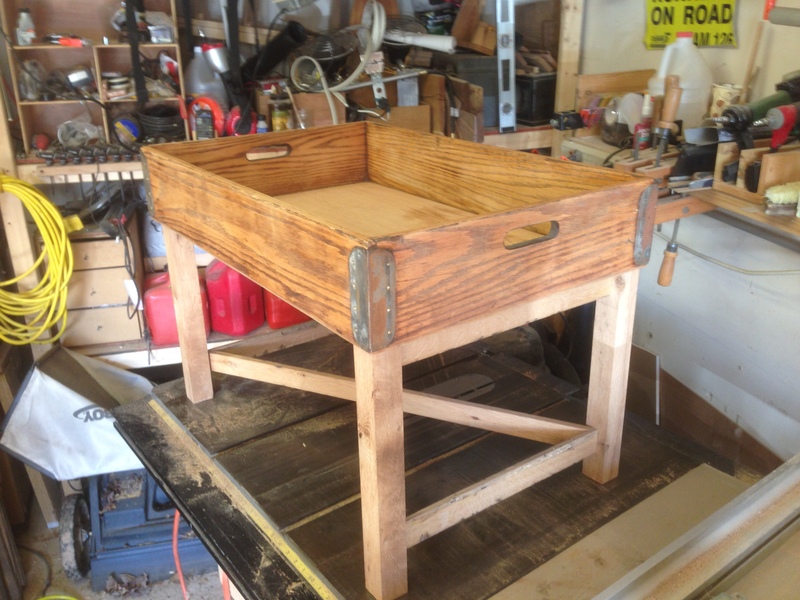 One set of mortises complete. 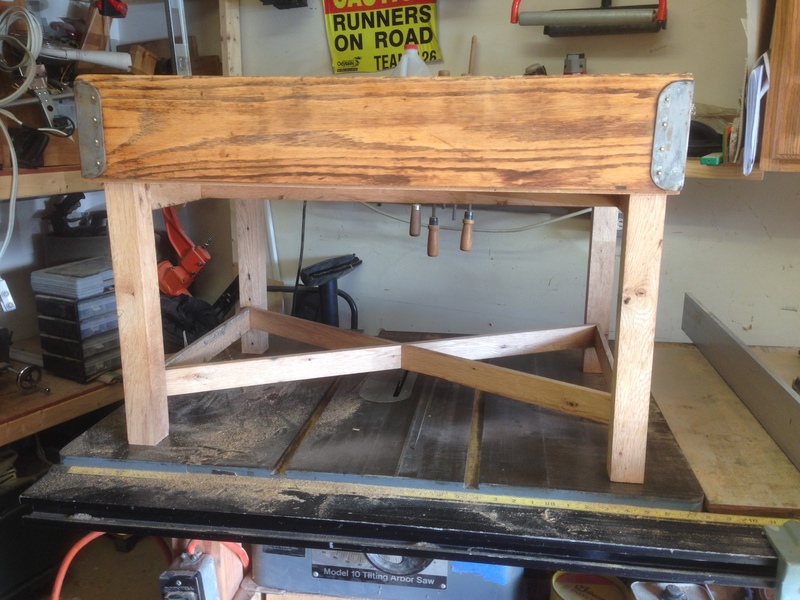 Top and bottom mortises completed for each leg. 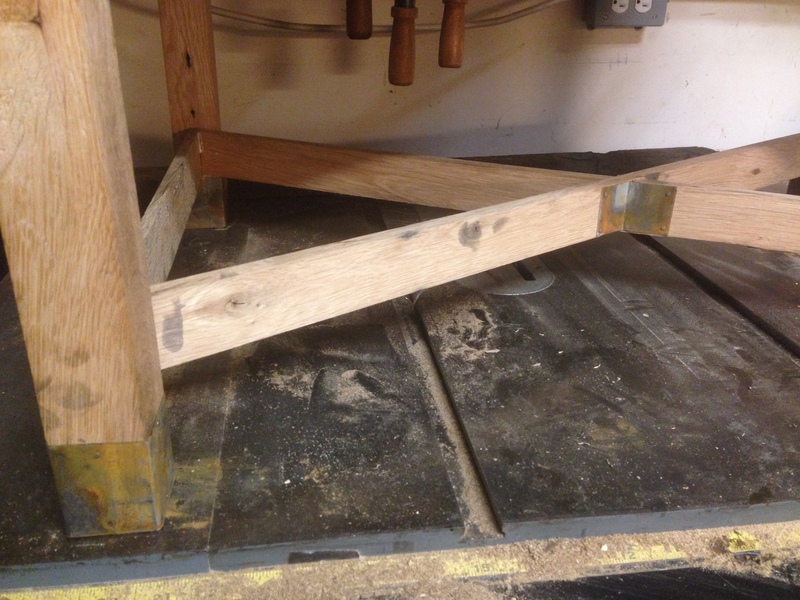 Tenons set in the mortises. Finished set of legs awaiting the attachment of the braces. 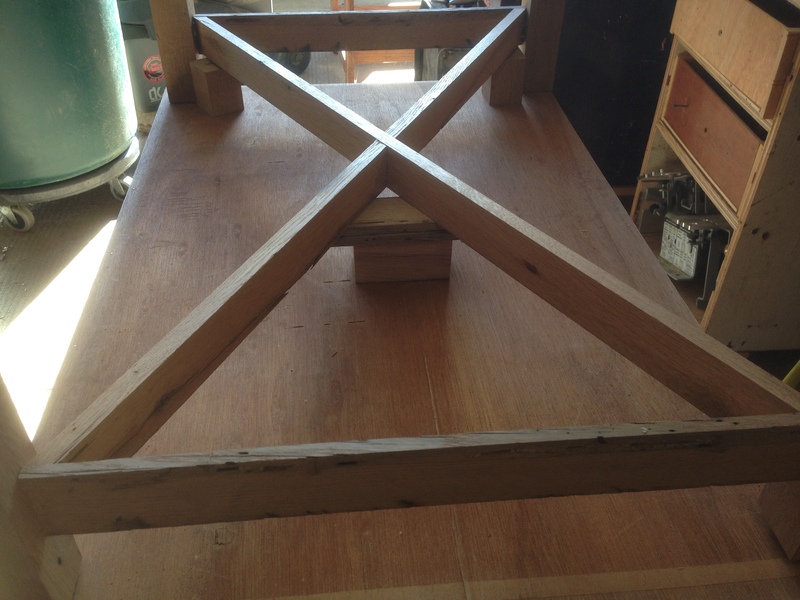 Once the legs were fitted and glued up, I moved on to designing the cross bracing. The cross-braces would join to the stretchers providing stability and visual interest. I also planned to add an additional brace at the top of the base to support the bread tray and provide addition rigidity. The finished cross braces and top brace fastened in place. The cross braces were designed to be an interlocking lap joint for a tight strong joint. They were cut on the table saw together at one time to ensure a tight fit. I set the angle of the cross-cut guide to the same angle as the cut on the end of the braces where they join with the stretchers. I set the blade height to half the thickness of the stretcher height so that the braces interlocked perfectly. In order to make the correct cut, I first laid out the braces marking the direction of the cut and then reversed one of the braces, aligned the cut marks and made a series of cuts until the combined thickness of the cuts matched my width of the brace. 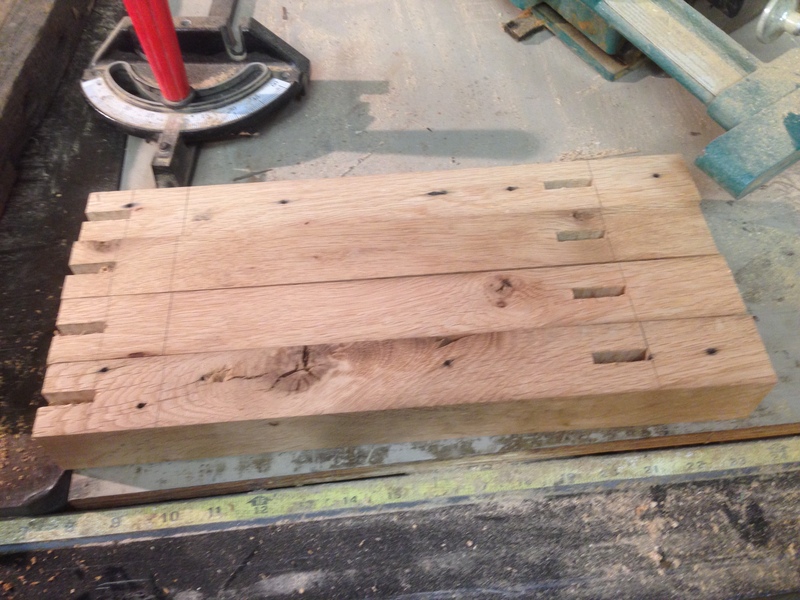 Cross braces laid out for marking, prior to cutting on the table saw. Bottom braces joined, glued to stretchers, and pinned. 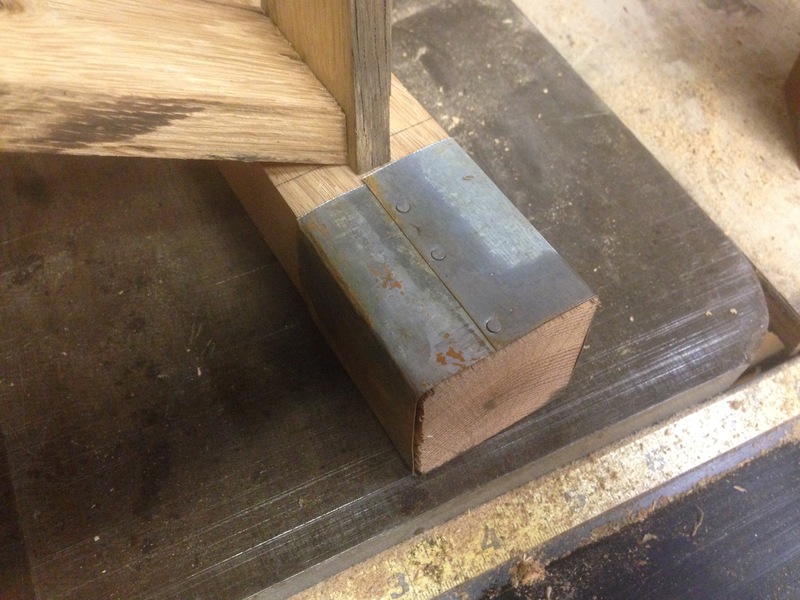 A locking lap joint secures the two cross braces together with a strong and attractive joint. 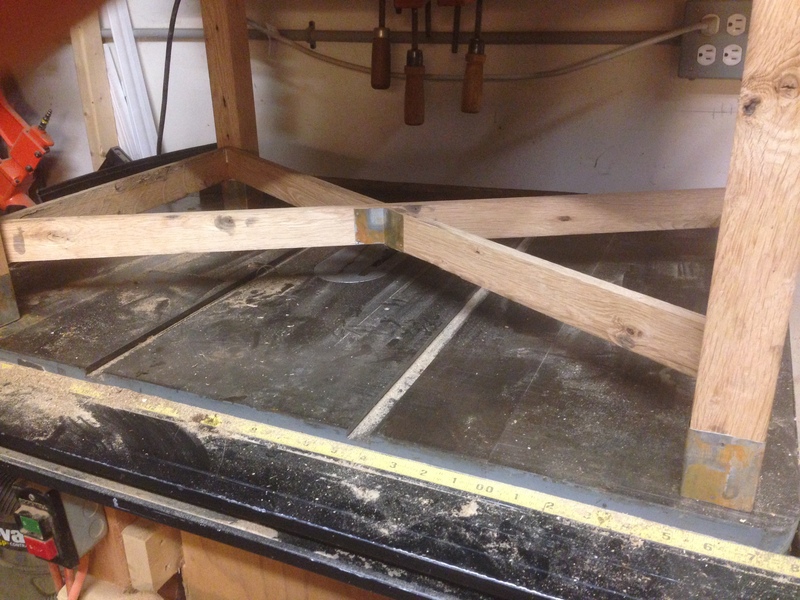 I cut another brace to span the top two stretchers as well. A little glue and some pin nails to secure the pieces while drying and it was on to the next step. Top brace glued and pinned. With the basic construction complete, it was time for a few final design enhancements. The original bread tray has reinforced corners of either tin or galvanized metal. I wanted to pull some of those characteristics into the table base. So I decided to add wraps to the bottom of each leg and decorative metal plates to the intersection of the braces. I knew that getting the metal to match to original bread box was as important as the features themselves, so I took a little excursion to the internet to learn how to age galvanized metal. There are a lot of good sites on the web that provide varied advice on how to accomplish this (http://www.stonegableblog.com/how-to-age-galvanized-metal/). 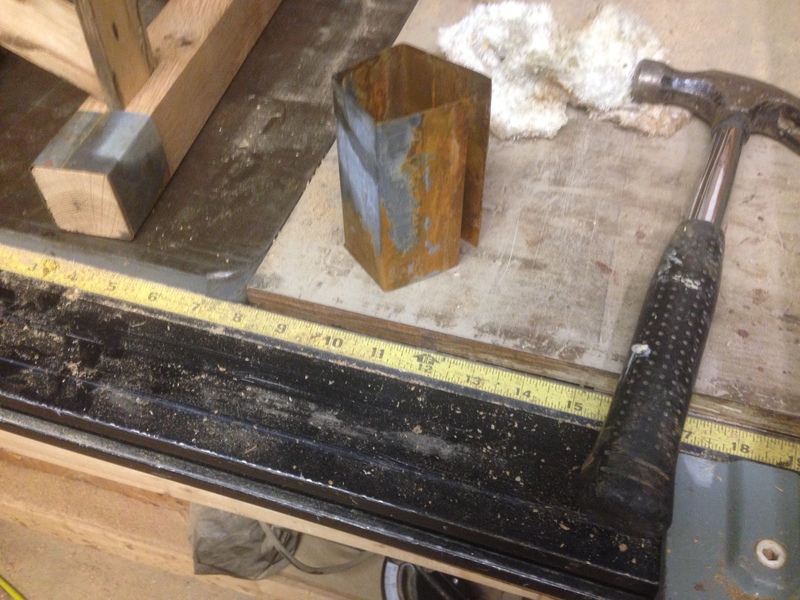 Galvanized foot, aged and trimmed to size. I don’t remember exactly which site I used as most included a combination of recipes, but for me the best results started with a thorough stripping of any coating on the metal using steel wool. I followed by soaking the pieces in some cider vinegar, removed the wet pieces, poured some hydrogen peroxide on the wet metal and added some salt. Things started to bubble and foam, and that was good enough for me. Before and after an overnight bath in a caustic solution. I am not exactly sure what I created but am guessing from my recollection of chemistry that the hydrogen peroxide and the vinegar created some dilution of hydrochloric acid and the salt acted as an accelerator. Needless to say, I wore rubber gloves to perform the processes. I let the pieces stand over night and was delighted to find significant corrosion and aging the next day. I cut the pieces of metal to the desired sizes and wrapped each piece around a leg, hammering each corner and tacking with small galvanized nails to secure. I did the same for the cross-brace support to carry the design feature throughout the base. The bread tray doesn’t need to be attached to the base but I will do so, once it is moved to its final location. Attaching the tray to the base will help when it’s time to move the table and may prevent a wayward leg or foot from dislodging the tray from the base and causing an unwanted spill or broken decoration. A final stain and finish still needs to be selected, in this case probably something dark to pull the pieces together and enhance the aged look of the wood. Its also possible that a glass top or something similar could be added to the table to better facilitate the use of the table and perhaps improve its footrest functionality. That remains to be determined. Nonetheless, I think the entire project will total less than eight hours, but more importantly preserve a timeless piece from the past.